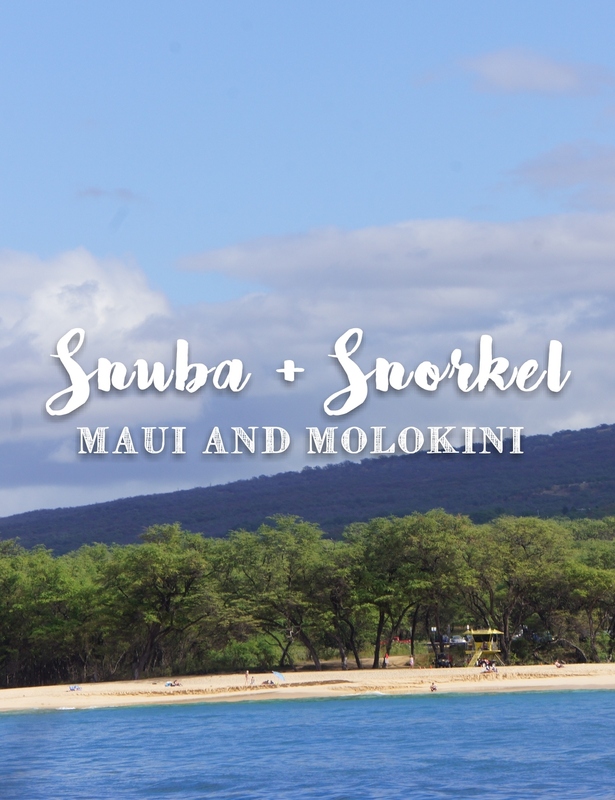 I'm so excited to share one of our big adventures in Maui, snorkeling and snuba-diving. 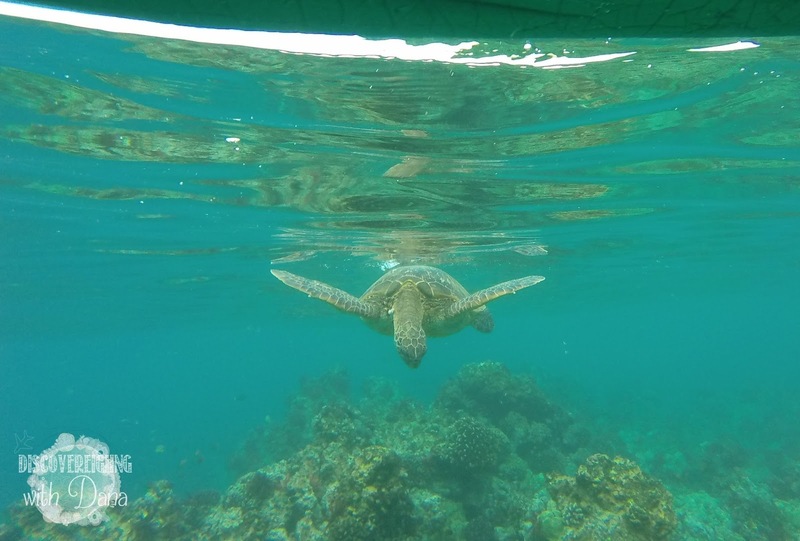 We took a tour out of Kihei, Maui with Maui Magic. They were great! The guides were wonderful, so knowledgeable, and even helped us spot humpback whales (which, don't worry, I'll share about later this week). 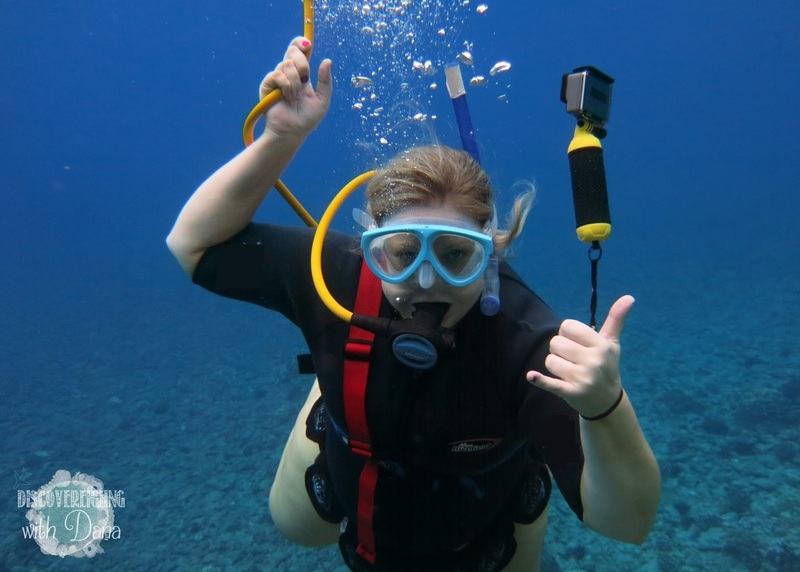 We decided to try snuba, a cross between snorkeling and scuba diving. 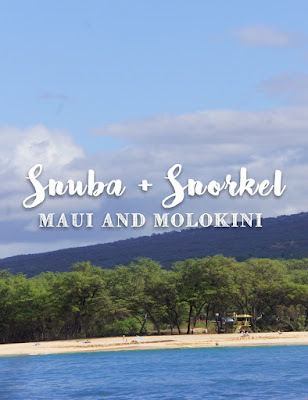 Snuba doesn't require lengthy training and certification like scuba diving requires, you simply wear a mouth piece (and eye/nose mask, of course) that is connected via 15-ish foot long tube which leads up to a raft holding air tanks. Lovely was absolutely NOT a fan. Me on the other hand, once I had the hang of it, I loved it! I'll admit it was very wavy and tough to get used to it, but once I learned (within a few minutes) how to control my breathing, I was rocking it! I found that if I stayed well below the surface the waves didn't affect me much. As long as I controlled my breathing, it was just fine, but that's not to say I didn't inhale some salt water a time or two. :) I would just head back up to surface as quickly as I could, catch my breath, readjust my gear, and head back down. The breathing is truly the key, slow, easy breaths, not fast & heavy. 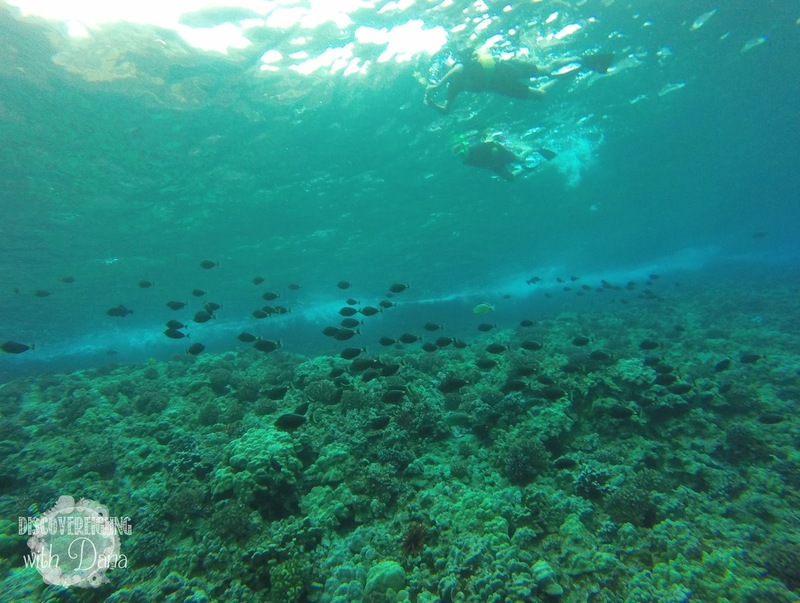 Anyway, we snuba & snorkeled on one outing, starting out at the famous crescent-shaped crater, Molokini. This is one of the best places in the world, so I've read, for diving, and I was not disappointed! Our snuba guide, pointed out beautiful fish, coral, and other sea creatures, and took amazing photos of it all for us. 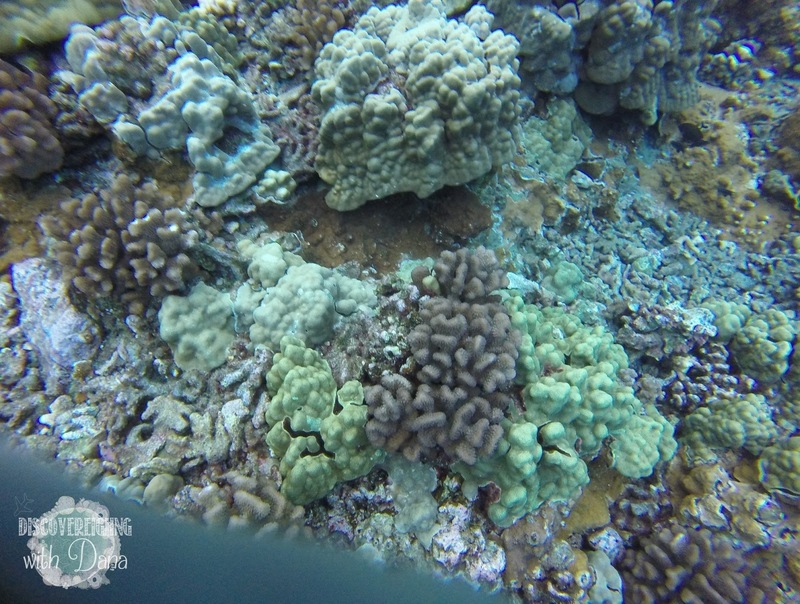 A couple of the photos that I'm sharing are from him--you'll be able to tell the difference!--the others are taken with our Go-Pro. Though it doesn't take the best underwater photos, I was really, really glad to have it! I feel like it would have worked better it it were sunny, which it was not that day. Drab & overcast! But we didn't let it stop a great time. The sun eventually came out, and we enjoyed the adventure. 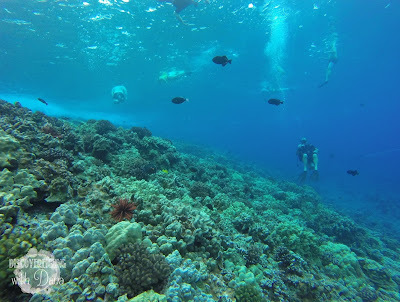 For the snorkeling portion of our trip, we headed back to the Maui coast towards Makena Bay. 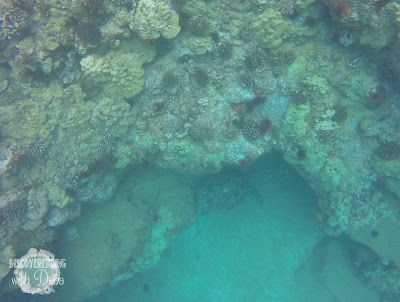 We anchored off the shore of Maluaka Beach, a prime spot for sea turtles. While the crew prepared lunch, the adventures set out to snorkel! Lovely wasn't feeling it after his snuba fiasco, so he stayed on board, and took photos and fed fish from the boat. 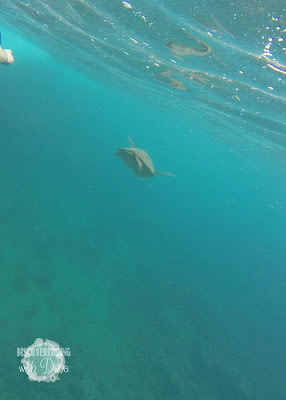 I, however, wasn't going to miss out on seeing the angelic sea turtles of the area. From the boat, it was about maybe a 20-30 yard swim to get to the coral where the fish and turtles like to hang out. Once I made it to a good spot, I just hung out there, looking in the water, with an occasional peek up to be sure I hadn't drifted away. Ha! Since I was snorkeling this time, I opted for a boogie board to help me stay afloat. It was super helpful as I just held it out in front of me with both arms, then stuck my head down to see. 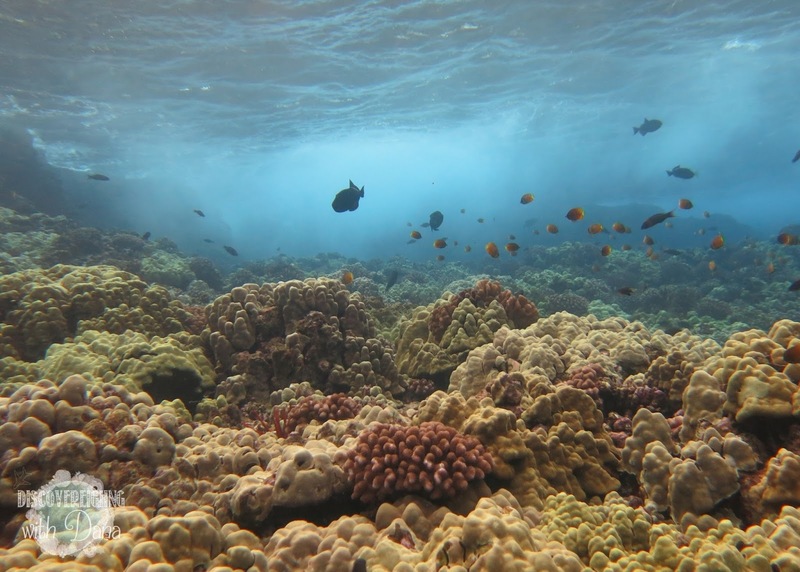 I didn't have to worry about diving, exerting much energy paddling, or getting water in the snorkel tube. It was a great technique, and made the snorkel experience much simpler and more enjoyable! But let's get to the important part, the turtles! 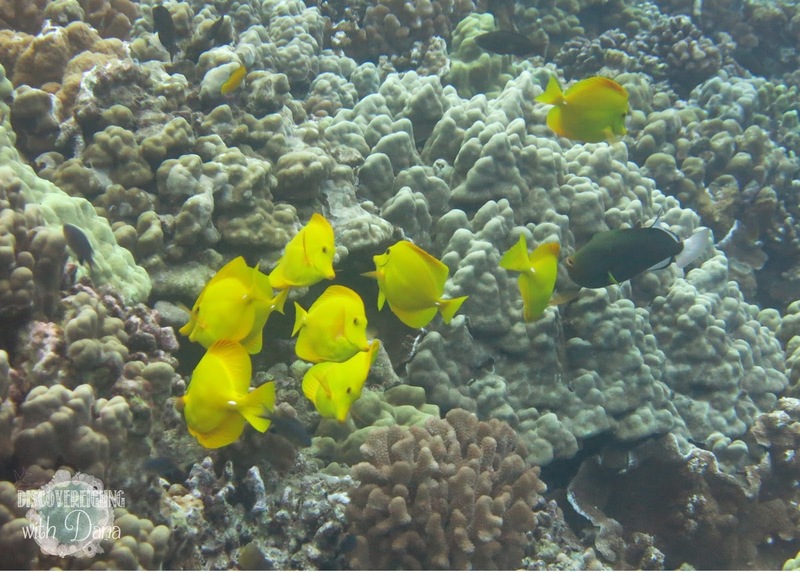 Here we saw a few tropical fish, but the highlight were a couple of sea turtles. They are like angels! The way their bodies are shaped and how they glide through the water, in my opinion, they look just like angels. It was such a treat, and an experience I will never forget! 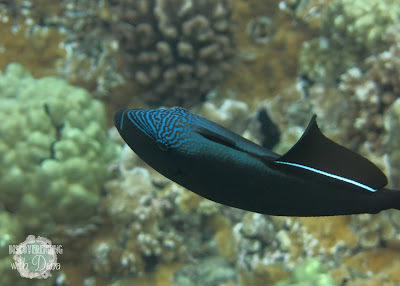 I hope you enjoy the photos, and if you plan a trip to Maui, will consider a snorkeling adventure with Maui Magic. You won't regret your choice! Aloha for now!